Make your first deposit and receive an equal sum of bonus, up to $777. The first deposit bonus gives you additional 10% of cashback. Moreover, when you make your first deposit, your account can be instantly credited with up to $50 for free! 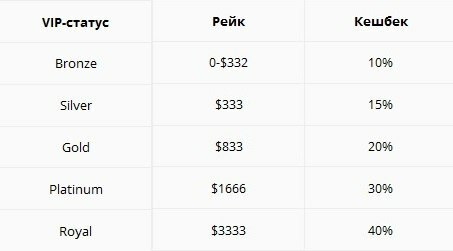 There exist 4 VIP levels at PokerKing: 15%, 20%, 30% and 40% of cashback. To achieve these levels, you need to generate the following amount of rake within a month: $303, $758, $1515, $3030, correspondingly. Moreover, to maintain these statuses, you need to generate half as much rake per month! For example, if you got VIP level 4 and 40% of cashback, to keep on receiving it the following month, you just need to generate only $1515 of rake, not $3030. Most poker rooms of WPN network takes commission from all deposits and cashouts (5% of the transfer amount). PokerKing’s attractive advantage is that you can make any number of deposits, as well as 1 cashout per month, without any commission. A second and all successive cashouts, made in the same month, will be charged with 5% commission. Rake race for SNG players and excellent tournaments for MTT players! WPN network offers a special rake race SNG Treasures. Over $20 000 guarantee, as well as over 70 prize places await the real grinders! If you interest is SNG and MTT, PokerKing is a perfect choice, as it offers series with big guaranteed funds! 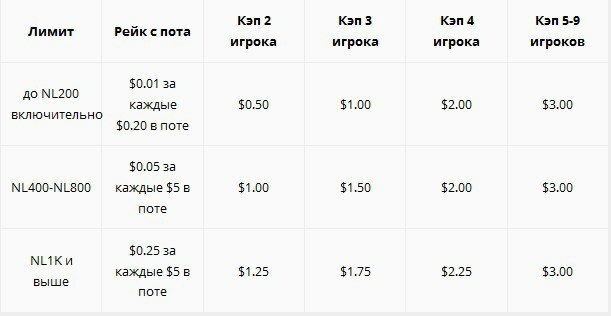 Free money during deposits – $10, $5 и $2! New players can take special bonuses on deposit that, besides the deposit bonus itself, offer free $10, $5 or $2. Visit the PokerKing website for details of this offer. After making your first deposit, you will get access to a freeroll for new players, which is held every Saturday, 13:05 MSK, with an insanely weak playing field. All poker rooms of WPN network take part in the royal rake race “King’s Treasures”. Huge prize money and 100 prize places are waiting for you every week! Winning Poker Network is famous for its weak playing field due to the presence of many players from the USA and Canada. The peak traffic of ‘fish’ players is night hours and early morning, from 03:00 till 10:00 MSK, because of the time difference with the USA and Canada. You can take an unlimited number of 25% reload bonuses (up to $200 each), while making deposits from Skrill or Neteller. Reload bonuses add 10% of cashback, besides the amount that you earn within the room’s VIP system. After making a deposit, don’t forget to contact the support team of the poker room via their live-chat, or by e-mail, to activate your reload bonus! Make your first deposit and get a bonus amount equal to it, up to $777. The first deposit bonus gives you 10% of cashback, besides the amount that you earn within the room’s VIP system. Moreover, when you make your first deposit, your account will be instantly credited with up to $50 for free! After making your first deposit, don’t forget to contact the support team of the poker room via their live-chat, or by e-mail, to activate your first deposit bonus! You have 90 days to receive the full effect of this bonus. If you generate more than $500 per month, you can get a free monthly subscription for a hand history of 1 limit of stakes. To get this subscription, send a short message by the e-mail that you provided during registration to support@pokerability.ru: 1) Your nickname at PokerAbility; 2) Your Login at PokerKing (but not your Nickname there! ); 3. Limit of stakes necessary for the subscription. You can get a subscription for 1 month right after your registration, prior to generating $500 of rake. However, if you don’t generate the necessary $500 of rake at the end of the month, you will be denied a possibility to get a free subscription in future. IMPORTANT!!! To prolong a free subscription to the following month, send another request to support@pokerability.ru at the end of the month, using the given message form. Immediately after your registration at PokerKing is confirmed, you can get a dark layout of PokerAbility. Leave a request for the layout in the special forum topic , and we will send it to your e-mail that you provided during registration. Poker King is an exceptional poker room of the US based Winning Poker Network (WPN). It was created as an off-line poker room in 2013, however, joined WPN in 2015. It is controlled and managed by King Enterprises N.V. owned by Vinko Dobrosevic. The room rake is 5%. PokerKing Royal Club is a room loyalty system. 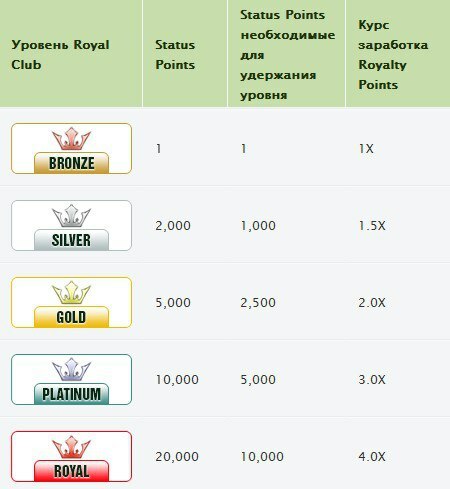 It is based on a set of Status Points (SP), a certain number of which gives a corresponding Royal Club level. In turn, each level has its own rate of calculating Royalty Points (RP) (points exchanged for money). The higher the level, the bigger and the greater the percentage of your cashback. Six (6) Status Points (SP) are charged for $1 of tournament rake and 6.6 SP are charged for $1 of cash rake. Upon reaching a certain level, your task is to earn only half of the points for a calendar month in order to maintain it. Moreover, an additional 30 day period is provided to fulfill the terms for maintaining the level attained. Points can be exchanged directly in the poker client at any time. To do this, use section "Rewards Zone." The common exchange rate is 66 points for $1. The minimum amount is $7. The signup bonus is 100% up to $ 777. The deposit allows you to choose one of the bonus options. Bonuses are repaid at $2 for 135 Status Points. Therefore, the signup bonus gives a 10% cashback. In PokerKing, a hallmark of this bonus is that you get a part of the bonus instantly, i.e immediately credited to your account. The amount of this payment is $50. You have 90 days to win back the bonus. Kings Treasures is an advanced weekly rake race in which all room players participate automatically without additional fees. The prize pool is formed from the rake collected at tables. The race involves 6 and 9-max cash tables only. Two (2) of each 6 rake cents make up the prize pool of the race in cash table (all except HU) and tournament (MTT only) games. For each two cents a player gets 1 point for the leader board. You need to collect more than $500 rake a week to make it into the race rating. The current leader board is always available on the right upper corner of the poker client. Sit & go treasures is an advanced weekly rake race similar to the previous one, but only for CIS based players (the latter can take part in both races). There are special CIS tournaments, e.g CIS On Demand (6, 12 and 18 max turbo CIS with late signup and re-entry within 30 minutes). There players can get twice as many points. There are also happy hours (from 11:00 am till 2:00 pm), during which CIS based players can get twice as many rating points. There are also 4 prize levels - 1st - $1250, 2nd - $500, 3rd- $125, 4th - $50. They are divided into 100 players. Reload Bonus 25% to 200%. Although via different payment systems, you have a Reload Bonus credited for any repeated deposits, which is to be won back the same way as the signup bonus. The bonus is valid for 60 days. - Multiple options for encouraging players - VIP system, reloads, two races. - Russian-language site and support. Please sign up using our instructions without any promotional codes. Required documents - any ID (passport, driver's license). All standard deposits and cash outs are available: bank cards, Skrill, Neteller and other e-wallets. Cash out terms are usually within 2-3 business days. Players, who use bank cards, are usually contacted by the security service for verification purposes, therefore, be sure to include your current phone number during signup. When using Skrill and other electronic systems, your account e-mail must coincide with your e-wallet e-mail. In 2015, some room policy changes took place. From now on, only one fee free cash out up to $2500 within a calendar month. All cash outs above this limit and subsequent cash outs within the same calendar month are subject to a 5% fee.